Penge is a Celtic word meaning "the hill in the forest" the forest in question being the Great North Wood that covered much of the area to the north of Croydon. Never a parish in its own right Penge was historically part of the Manor of Battersea the rest of which it was separated from by 12 miles. Until 1809 Penge was little frequented except as a source of firewood or for grazing sheep on the common. In that year the Croydon Canal opened for trade and leisure. 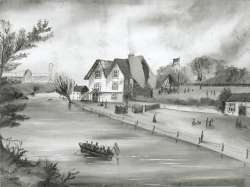 A wharf was opened and visitors from London and Croydon began to arrive to enjoy the Penge countryside. Development began after the common was enclosed and plots sold off for building in 1827, Croydon and Anerley Roads being laid out at the same time. One plot was purchased by William Sanderson (c. 1801 - 1871), a Scottish silk manufacturer who built the first house on the common, naming it Annerley reputedly because it was the annerley (only) house there. Building was further encouraged by the opening of the London-Croydon railway in 1839, replacing the canal. 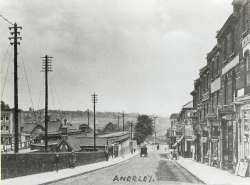 In return for providing land for the railway a station called Annerley Bridge was provided for him for travel to his office in the city and so the district of Anerley was born. The short lived tea gardens (1841-68) were a popular attraction next to the station and on the banks of one of the remaining sections of the canal until killed by the rival attractions of the Crystal Palace. The Crystal Palace (q.v. 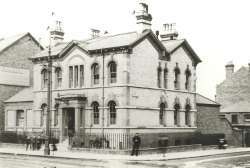 ), moving from Hyde Park in 1854, was the main catalyst of growth for Penge. In 1851 it was a small settlement of 1159 inhabitants who's first church (St. John's) had only opened the previous year. But by 1871 it was a town with a population of 13201. Being mainly on the lower slopes of Sydenham Hill the houses were mainly smaller that those higher up near the Palace. By 1900 Penge was in reality a suburb of London but administratively it was a mess having connections with Lewisham, Croydon and Camberwell and the newly created London County Council. In this year it was decided it should become independent and Penge UDC was created, the town being transferred from Surrey into Kent at the same time. From 1906, the Croydon tram network was electrified and the network extended via Norwood to Penge and Crystal Palace. The Penge route closed in 1933 but the Crystal Palace one survived until 1951. Both were replaced by buses. 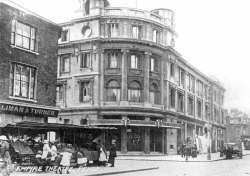 Some of the original larger Victorian developments to the south of the High Street began to be replaced by newer houses after the First World War but it was World War 2 that resulted in the greatest changes. Reputedly the most bombed town in the country, the most serious damaged occurred after 1944 when the flying bombs began to arrive. Post war redevelopment was not as radical as originally planned but major new developments took place in the areas most affected by bomb damage including the building of the recently redeveloped Grove's estate. In 1965 Penge lost its independence, being taken in to the London Borough of Bromley, many services transferred to the new administrative centre but Penge retains a High Street full of small shops and a market in Maple Road.